This pattern is a photo tutorial for using a self striping sock yarn kit, with one skein of striping yarn and a mini skein of solid yarn, to make two pairs of socks. The tutorial shows how to use all of both skeins to eliminate leftovers and allows you to work from the toe up or from the cuff down. You can work at any gauge and at any stitch count, so the socks can be customized to fit you. Step 1: Cast on and work either a toe or cuff using the mini-skein. I worked a toe using the red mini- skein and ended the toe at 64 stitches. Once the toe has the correct number of stitches or the cuff is the desired length (I recommend about 1 inch/2.5cm), change to the striping yarn, being mindful of the striping pattern. It may be necessary to wind off some of the yarn to get the right stripe placement. In my sample, I wound off some red to have a white stripe followed by a green stripe on my sock. Step 2: Knit in a tube until all of the striping yarn has been used, again being mindful of the striping pattern preceding the change to solid colored yarn. If you have any of the striping yarn remaining, set it aside for use later. In my sample, I ended up with a small ball of red and white yarn and about 60 inches (152.5 cm) of knitted tube. Step 3: Change to the solid colored yarn and work either a cuff or toe, the opposite of what you began your sock with in Step 1. In my sample, since I began with a toe, I knit a cuff. This leaves you with one long tube sock. Step 4: Measure your sock length. If you knit socks often, you have an idea about the length of your foot and total sock length, but if not, you can use a sock you like to help measure. Once you’ve decided on your sock length, it is time to prepare your knitting for cutting. Using a sock needle (or tapestry needle and smooth yarn), pick up every stitch in a single row as shown on the right. Step 5: Lift a single stitch in the row above your needle and snip that stitch. Then carefully unravel the clipped row and place the live stitches from the next row onto a spare needle. When you are done, you will have two sets of live stitches, one attached to the sock with the toe and the other set attached to the long sock with a cuff. Step 6: Join the solid colored yarn and complete a toe or a cuff as needed. Then complete an Afterthought Heel. One sock is finished. Step 7: Returning to the partial sock, join the solid colored yarn and complete a toe or cuff as needed. You now have one (now shorter) long tube sock. Step 8: Using a flat surface, place the long sock and your completed sock next to one another to determine the location of your next cut, matching stripes if desired. Complete Steps 5 and 6 again. You now have one complete pair of socks. Now you have a shorter partial sock with a toe at one end and live stitches at the other. This sock is probably shorter than the combined length of the first pair of socks, so you will need to plan carefully to achieve the desired foot and leg length using the available yarn scraps and remaining mini-skein. Step 9: Unravel stitches if necessary to match the striping sequence of the finished end of the sock and return live stitches to needle. In my example, I had a red stripe at the end near the live stitches, so I unraveled that and used it to begin my red toe. Step 10: Working from each toe end mark the placement and create two afterthought heels, using any available scraps from previous steps and ending with yarn from the mini-skein. Step 11: Take any remaining yarn from the mini skein and divide it into two equal lengths. This is the yarn for the cuffs. Step 12: Divide the section between the two heels to form the cuffs. 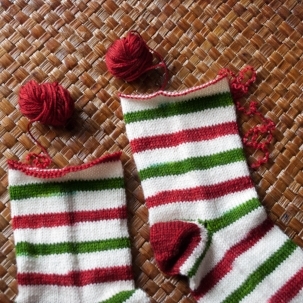 Determine the middle (stripe 5, in this case), snip a stitch and separate the two socks by picking out this round of stitches. As you can see, my sample had a red stripe in center, which works well for my striping pattern. You can unravel as needed to match your stripe sequence or use leftover bits from Step 11 to make longer cuffs. Step 13: Knit the cuffs with remaining solid colored yarn. You now have two complete pairs of socks from one sock yarn kit! Do you prefer a different sock construction method? Would you rather have one pair of perfectly fitting socks and a practical way to use the leftovers? If so, be sure to subscribe to my email list to be notified of the next segment. Subscribers will have free access to the pattern shared in Part Two.